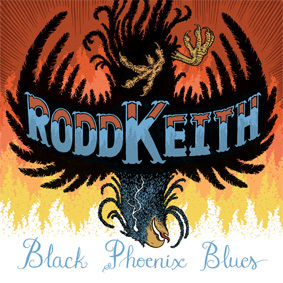 Black Phoenix Blues is the third Roaratorio collection of the best of Rodd Keith’s vast output. Dating from 1966 to 1974, the sixteen previously unreissued songs showcase the scope of his work: the should’ve-been-a-hit “You And I”; the elegant exotica of “I Love Lovely Chinese Gal”; the history lesson of “The Explosion Of Holden 22 Mine”; the harrowing psychokiller musings of the title track; “I’m Proud To Be A Hippie From Mississippi,” the stoner’s answer to Merle Haggard’s “Okie From Muskogee”; the low-fi “The Game Of Love” (which, in the tradition of Keith’s infamous “I’m Just The Other Woman,” prompted the dissatisfied customer to request a more conventional re-take); the disturbingly desperate “Sing My Death Note,” which was discovered on one of Keith’s private reels; and the unclassifiable wtf?-ness of “Abidin’ Tuh The Rule.”To call Rodd Keith the king of the song-poems (also known as the “send us your lyrics” quick buck-demo mill) is damning with faint praise: no one else in that shady backwater of the music industry possessed an array of talents as distinctively individual as his. As gifted a singer, composer and arranger as he was, his genius was destined to remain a well-kept secret during his lifetime by virtue of the complete disregard – verging on invisibility – in which song-poem records were held. He was a commercial musician in the most literal sense of the word, but within those confines, he displayed an oddball, personal vision that frequently transcended the work-for-hire nature of his music. A limited edition LP with artwork by Josh Journey-Heinz and liner notes from blues guitarist Debbie Davies, one of Keith’s musical and personal compadres from the early 1970s. Download coupon included.